To apply for any position listed, please submit a resume and cover letter along with an Employment Application to Abby Field at abby@pbcb.cc; or mail your submittal to PO Box 21 / North Chatham, MA 02650. PBCB seeks a Seasonal Registrar / Administrative Assistant. The Registrar is responsible for delivering high quality customer service; inputting administrative data pertaining to program registrations / tracking of member payments; collecting and filing medical forms; and answering the phone and emails. The Registrar may also be called upon to provide general administrative support to other PBCB staff and the camp program as needed. • Performs program registrations/enrollments, tracking and reporting of program participants, handling incoming calls and in general, providing a high level of customer service interfacing with PBCB participants. A minimum of 2 years of equivalent experience is preferred. Must possess an understanding of computer systems including Microsoft Suite, spreadsheets, booking software, accounting procedures, and good business practices. This position requires the ability to communicate effectively with a variety of customers as well as the ability to manage multiple tasks and deadlines with minimal supervision. Experience in record/bookkeeping, data management, customer service and & general office functions a plus. Skills in working with families, conflict resolution and public relations. The Seasonal Registrar / Administrative Assistant reports directly to the Development Coordinator. The Registrar is expected to work Monday through Friday, and may occasionally be needed on Saturday or Sunday during the summer boating season. Hours somewhat flexible. Prior to employment, the successful candidate will have a reference and background check conducted. 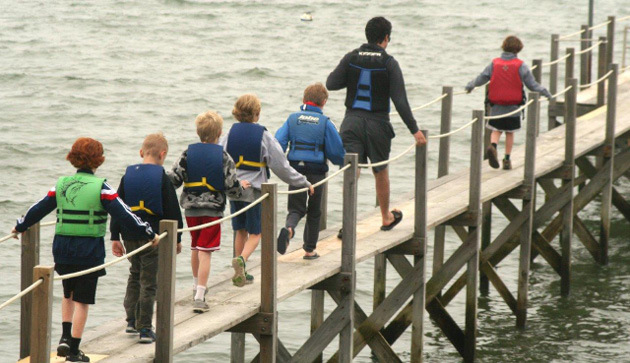 PBCB hires experienced sailing instructors each summer season. Our need for waterfront staff extends from May through September. "Working as a sailing instructor at PBCB brought my worlds together – sailing, biology, working with special needs kids. It has reinforced my direction in life."